Walmart was listed in our “where to buy a new iPad” post as a good place to get the third gen iPad, but today they sent out an email to several sites stating they will actually start selling the hotly anticipated device tonight at 12:01AM local time. This means if you want to beat the morning lines at Apple Stores and don’t want to wait a few weeks for a delivery, spending your evening at Walmart may be the best bet. We confirmed the sale by calling around to a handful of Walmarts in various western states and all but a few stores confirmed the midnight offering, though they either didn’t know or wouldn’t specify which models were to be available other than “black and white” colors. We were told stocks ranging from 15 to 25 units on hand, though many stores were mum on details and some said they weren’t allowed to say. If you want to be the first person amongst your friends and colleagues to have the new iPad, you will need to head to your local Walmart. 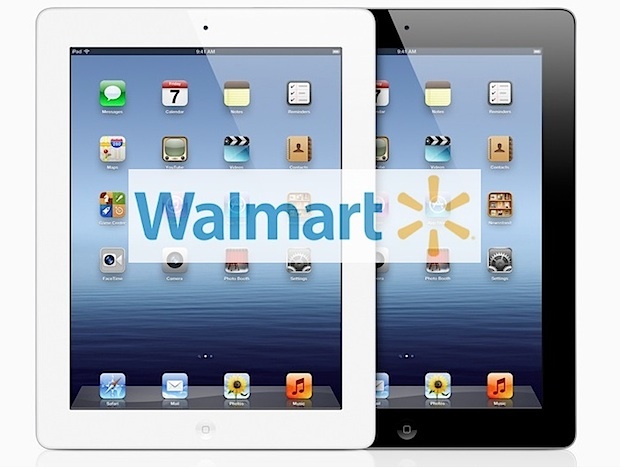 Starting at 12:01 a.m. local time on March 16, a limited supply of the new iPad will be available at your local 24-hour Walmart. Other retailers’ doors don’t open until 8 a.m. local time, so you can get to work on time and beat the rush by coming to Walmart. You can find a local 24 hour Walmart using their store locator, though it may be worth calling ahead to confirm the sale is on and that units are in stock. Good luck! Walmart at midnight? Sounds like an adventure. Sounds like it is going to be like Black Friday, Walmart style. Amazing these stores “have” new iPads yet both my super walmarts dont have any. According to them they werent shipped any. Best part customer services had a nasty attitude when I asked. I say f$&k Walmart. Is it even possible to say ‘local’ more times in one paragraph as this post just did? It’s WallyWorld, do you expect Pulitzer quality writing? I picked mine up from Walmart on my way to work this morning at 8am. I was the first one there, they didn’t even have them unpacked from the back storage room yet. It was a breeze! In and out in 10 minutes.